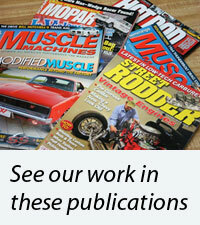 The import performance market has enjoyed tremendous popularity and growth in recent years. As a result, more and more manufacturers and after-market companies are marketing more and more products such as pistons, piston rings, camshafts, valves and even modular cylinder sleeves for these import vehicles. The quality of these products demands a greater need for precision machine work and meticulous assembly. 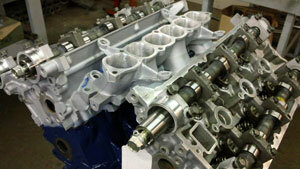 Eastwoods provides complete machine shop services for your performance import engine. Eastwoods has the ability to bore cylinders, install cylinder sleeves and install modular cylinder sleeves (MID) on our VB160SF machining center. Once installed the sleeves can be bored in the same set-up and then plateau honed to a finished dimension in our honing cabinet. 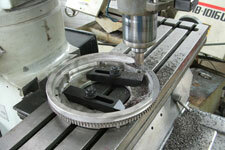 We manufacture and install our own Block Guards for open deck engines in-house on our CNC Bridgeport. Cylinder decks are resurfaced and squared to the crankshaft on the VB160SF machining center where we are also able to set piston-to-deck heights in order to achieve desired compression ratios. 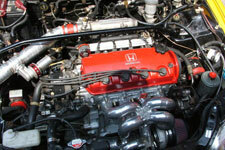 This is critical when building "high boost" engines. 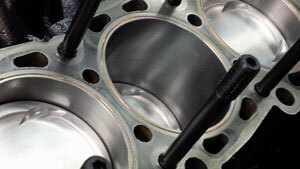 Our CNC Bridgeport allows us to machine cylinder decks for "O"-rings used in "high boost" performance applications. Performance cylinder head work includes machining for oversized valves, 3-angle valve jobs and cbn resurfacing for multi-layered steel and other performance cylinder head gaskets. Eastwoods also offers porting & polishing as well as gasket-matching services. Flywheels can be lightened by machining material from them on our CNC Bridgeport and then computer-balanced before installation. 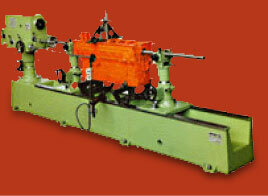 Crankshafts are ground and micro-polished in-house. Performance rotating assemblies need to be weight-matched and then computer-balanced in order to insure the level of performance that's expected from them. Contact us about fabricating custom parts or any engraving services that you may be interested in. 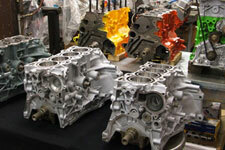 Each of our performance import engines is meticulously assembled. These engines are the talk of both the streets and the strips and are known for their exceptional horsepower and bullet-proof reliability. Contact us by email or at (860) 749-2903 to let us know that your part will be on the way. You'll need to provide us with all of your contact information and we'll give you a reference number to include with the item that you're shipping. Whether an engine block, cylinder head, crankshaft or other component be certain to package your part well for shipping. Disassemble all components that do not need to be shipped, clean your part well and wrap this in a plastic bag or two (garbage bags work well). Choose a sturdy container (strong cardboard or plastic tote) and pack all around your part with packing material (ie., newspaper, packing peanuts, plastic air pillows, etc.) so that nothing shifts during shipping. Reinforce your package with plenty of duct tape. Be certain to include a short note along with your reference number. Also write your reference number on the outside of the box. Take your package to any freight forwarder such as UPS or Federal Express to ship. If you would like us to provide you with a UPS call tag please contact us by email or at (860) 749-2903. Please have your package dimensions and weight as well as your credit card information available.